In the summer of 52, my dad and I drove our 1952 Desoto to L. A. for the VFW convention. When we got to Whitehorse, the road was 2 feet deep in mud. We had to wait for about 3 hours in the 100% sun, our hood got sun burned, it looked like someone took sand paper to it. A road crew chained 6 cars together and hooked us to a bulldozer and pulled us for about 3 blocks, then another crew hit us with hoses and blasted the mud off. There was a picture of the Wasilla Road House hanging in the mall in Palmer with our Desoto with the sun burn. We were running the Road House at that time. Ron, your Alcan Highway story reminds us just how challenging the Alcan was in the early days and what kind a character, resolve and resourcefulness was needed by early motorists. 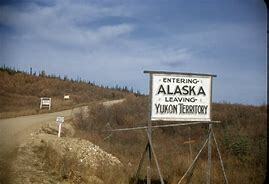 The Alaska Highway in 1952 was no Sunday drive. Thank you on behalf of all our readers for giving us a glimpse of what you had to go through to make that challenging drive. Mary and I last drove the Alcan while a good deal of the road was still not paved and we remember pulling into a facility just inside Alaska where we could use a water hose to blast the caked mud off our car and the under carriage. Your story of being pulled out of the mud by a bulldozer is amazing.